Welcome to Day #8 of Chocolate and Peanuts Theme Week, and Day #1 of Chocolate and Caramel Theme Week. 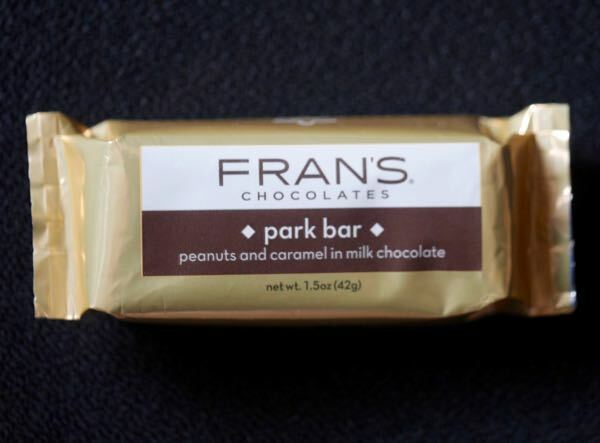 Today's Park Bar from Fran's Chocolates (Seattle, WA) was a blend of peanuts, caramel and milk chocolate. This small, but substantial, sweet confection was attractively wrapped in a shiny gold wrapper. It could be considered as a very high-end candy bar. The relatively short ingredients list included organic cane sugar (#1 on list), but also real cream and butter, milk chocolate, peanuts, tapioca syrup, and no artificial additives, preservatives or colors. It had golden caramel and peanuts with a soft crunch. 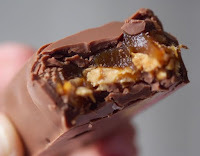 The milk chocolate covered bar was a little on the sweet side, but enjoyable nonetheless. The Park Bar was USDA Organic, Fair Trade and labeled as being gluten free.